A professional women’s business networking group for local businesses recently celebrated its second-year birthday. Debbie Heron of Roundabout Hinckley said that she set up Women that Connect as there was a need in the area for a professional business networking women’s group. Women that Connect has proved to be extremely successful and currently has 39 members. It is an exclusive membership group meaning only one member per profession/industry is invited to join which means it has a good, diverse mix of businesses. The launch meeting in September 2016 was a great success and subsequent meetings have proved similarly successful. It is proving a great way for Leicestershire and Warwickshire women business owners to meet. The lunchtime meetings are held on the second Wednesday of every month and are friendly and relaxed yet professional, allowing members to build new business relationships whilst cementing existing ones. As Debbie says she is so proud that Women that Connect is a fabulous group of dynamic, vibrant local businesswomen and since the launch a lot of business has been exchanged as well as some good friendships formed. Each month every member speaks about their businesses followed by a 2-course lunch and drink. This is then followed by a presentation by one of the members giving more details about their business. After the speaker, there also a forum where members can ask for advice on any issues they may be experiencing in their businesses. With our meeting format, members Lunch and Learn. 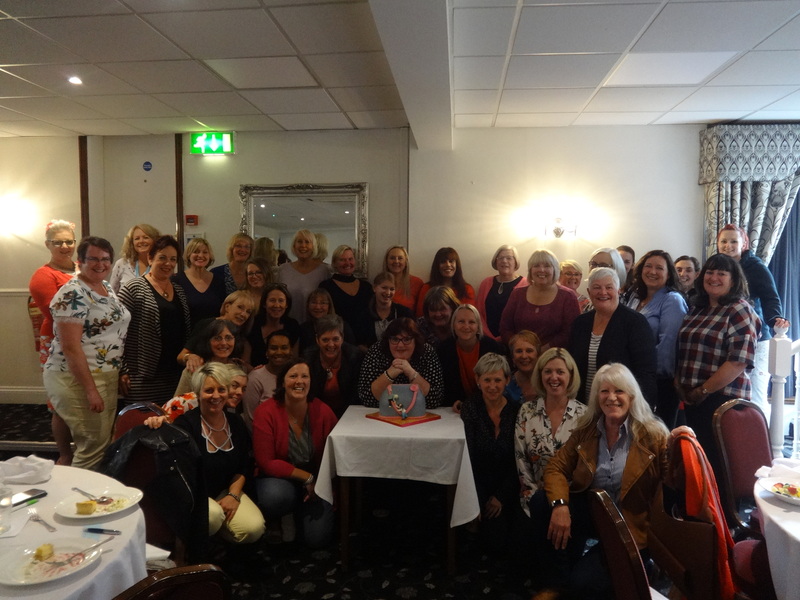 To celebrate our second year birthday meeting all 40 women attending were given a small bottle of prosecco and one of our members, Kate Jordin of The Bakewell Tart, made a beautiful cake to celebrate the second year anniversary. The cake was in the shape of a handbag with two women helping each climb up the side of it demonstrating the support group members give each other. Guests are very welcome to attend a maximum of two meetings a year if there is no clash with a business who is already a member of the group. The meetings are held 11:45am until 2pm at the Ullesthorpe Court Hotel with the next meeting being on Wednesday 5th December. Anyone interested in coming along to see what it is all about and to see if they would like to join this successful group, should contact Debbie of Roundabout Hinckley on 07751 211019 or [email protected] for further information and to see if the business slot is available. Why not take a look at the website www.womenthatconnect.co.uk and discover more about the members and the meetings.